Unleash Your True Genetic Potential with Mesomorph Pre Workout. If you have been looking for a strong pre workout chances are you came across Mesomorph. 2015 through 2019 mesomorph stands alone as the king of pre workout supplements . If you are looking for a pre workout that delivers on all levels then Mesomorph is for you. Keeping on reading below to learn how effective mesomorph is and what it can do for you! Chances are if you have been looking for a pre workout you already heard about mesomorph. The hype is real. Don't believe us, look at the over 192 reviews (and counting) we have on it. The proof is in the formula. Mesomorph was the first to deliver full clinical doses of its key active ingredients. Mesomorph contains 25 servings per tub.You may be thinking, why 25 and not 30 servings like everyone else? Generally, the higher the stimulant content the lower the servings. Yeah, its strong! To make it simple for you... Mesomorph has been the KING of pre-workout powders since 2015! Mesomorph is an complete pre-workout with No fillers and no crash! All Results! Isn't this what you have been looking for? Mesomorph represents an all-purpose energy, focus, hydration and exercise performance drink. Looking for more energy, laser like focus, and enhanced stamina? Try Mesomorph. Are you ready to reach new PRs? No, mesomorph has never been banned and is here for the long run. Does Mesomorph Pre Workout Have Caffeine? APS Nutrition confirmed there is approximately 300 mg of caffeine per scoop of mesomorph. You may be thinking, why is this even a question? Well believe it or not, we keep getting two different pronunciations for it. If you google how to pronounce mesomorph this is what comes up but this isn't how APS pronounces it. If you call us up to place an order, this is how we will pronounce it. This is also the way APS Nutrition pronounces it. Why Is Mesomorph So Effective? Its all in the ingredients. Having the right dosage and combination of ingredients is what sets Mesomorph apart. What results can I expect when taking Mesomorph? 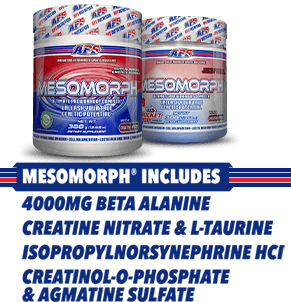 Mesomorph helps improve strength from right in the formula. 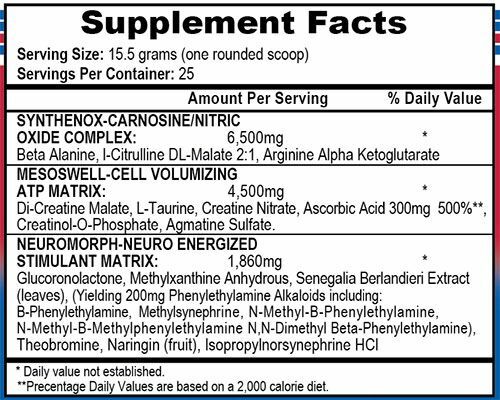 The Cell Volumizing Complex contains 3 types of Creatine. Creatine helps with energy levels, strength, and keeps the muscle cells hydrated. The combination of Beta-Alanine, L-Citrulline Malate and AAKG works to help buffer lactic acid. The combination of Senegalia Berlanderi, Caffeine and other stimulants delivers all day energy. This combination of creatines and taurine work to improve recovery. The combination of NO Complex and Cell Volumizing Complex aids vascularity. As mentioned above, Mesomorph contains 3 types of Creatine. But within the same complex, there is Agmatine Sulfate. Agmatine Sulfate helps promote cell hydration by inhibition (blocking) of nitric oxide synthase. The Nitric Oxide Complex helps fiend off waste products, i. e. lactic acid. Build up of lactic acid limits the number of reps you plan to do or cause you to burn out a little faster. Antioxidants isn't generally the first feature you think of in a pre workout. But it has it's place in Mesomorph. L-Ascorbic Acid or Vitamin C has antioxidant properties. This means it promotes neuro-protective effects and even may improve blood flow. 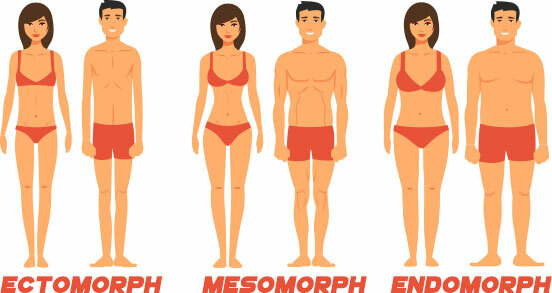 I'm Not A Mesomorph Body Type, Can I Still Take It? Of course you can. Mesomorph referrers to the ideal body type. People with this body type tend to have a more athletic or medium build. With an advantage of building muscle and losing fat with ease. Sounds great doesn't it? Not to worry! No matter your body type, Mesomorph Pre workout can help you unleash your true potential! Do I Need To Cycle Mesomorph Pre Workout? You will feel the effects of Mesomorph from your first scoop. But the best result being at day 15 and continue to improve till day 60. After about 8 to 10 weeks of use, we recommend that you take a break. After having been off pre workouts for 8 to 10 you may resuming usage. What's In Mesomorph Pre Workout? How Do I Take Mesomorph Pre Workout? That warm tingle sensation is mesomorph at work. Although it can be strong in some, it is not harmful in any way and will subside once body adjusts. As well as any heart, thyroid, or liver condition. Seizures, anxiety or depression, prostate enlargement or inflammation. Do not use if you are nursing or pregnant. Do not use if you are taking an MAOI. If any adverse symptoms occur discontinue use immediately and consult a physician. Keep out of reach of children. PLEASE NOTE: Product images represent the product offered but may not contain exact attributes. Please read product description for the specific attributes of this product. † PLEASE NOTE: The intention of the information above is for reference only. It is our goal to maintain and display accurate information. Yet, we can't guarantee it represents the latest formulation of the product. If you have any concerns, please visit the manufacturer's web site. Also the information above is not a representation of our views at Same Day Supplements. These are the views and information provided by product’s manufacturer. The Food and Drug Administration has not evaluated these statements. The intention of this product is not to diagnose, treat, cure or prevent any disease or illness. *Prices are subject to change at any time and items may limit to stock on hand. Best pre workout I've ever used!!! Looking forward to finishing this to try other flavors of mesomorph. Mesomorph gets you into Beast Mode! This pwo like hundreds another pre workouts. Love this product... I come off it for a while and my workouts do decline. I will be a repeat customer! Same Day Sups price, was the best on the internet. A1 & other sites have already stopped carrying Mesomorph, which seems to be a reoccurring trend with preworkouts. I used to take BlackStone Labs Dust & Tried this after hearing all the rave reviews. First container I bought of Mesomorph was Grape. I found the grape tasted awful but once I got to the gym and started working out, all was forgiven due to the great energy, awesome pump and amazing muscle endurance I gained. Loved using this pre workout so much (despite the taste), I decided to buy another container but this time Cotton Candy. Cotton Candy is a little sweet but very easy to drink so I would recumbent this flavour. First time buyer. Will buy again. Fast shipping, GREAT EXPERATION DATE ON PRODUCT. NOT EVEN CLOSE TO EXPIRING. Product as shown, price close to 20% less than other retailers/online stores. Great Taste...love the energy I got from this. Not only strength and strength have improved. Great product even better customer service. Products arrived earlier than expected!!!! Personally, I prefer the new formula of mesomorph over the old formula. Same amount of energy, focus, and pump between the two. Why Do I prefer the Senegalia formula? No kidding. The old formula works perfectly on me. Good energy for an intense workout, increased stamina (at least it feels that way; could be psychosomatic, I guess). No jitters like the caffeine formulas do. I can take this as late as 4 p.m. and can still get to sleep at 10. Can't do that with caffeine-loaded PWO's. This is a really good pre workout. You can work out for hours, I lift hour and half and do interval training for 3 miles on the treadmill. Keeps you focused and Energy levels super high..
very strong. started at half scoop. tried a full scoop a couple times but made me feel sick. I am a stim junkie, this preworkout has a life of around 1.5 hours. after that I get the absolute worst crash, it's like energy is being drained at a rapid rate and I literally need to go to bed RIGHT then. Ridiculous price for such a lousy half life. My husband loves this product. I am also using it. It gives us a great pump but we do workout hard (weightlift/ no cardio). I bought two for his Christmas stockings then bought one more for myself. He's got his friends using it now. I need to buy another in a few days. I got really excited about this preworkout when I read these reviews and ordered immediately. When it arrived, I couldn't WAIT to hit the gym and feel the rage! I woke up, mixed a full scoop followed by around 6 ozs of water and chugged it down. About halfway to the gym, my hands and ears started tingling. I was ready, I LOVE the preworkout rush. But it never came. I sat on the bench to hit the press about 35 mins in, but was yawning. I thought no way! So I tried a little more the following day. Nothing, not even a tingle :/ So I mixed a scoop and a half today, had a little tingle and a small self confidence boost but no energy rush. awesome clean energy, no jitters or crash, tutti-frutti is delicious! Firstly I like to thank samedaysupplment. I was abit hesitant from ordering from the site, I had to do abit of research about the company and read the reviews before I went ahead with the purchase. I was very glad I went ahead with it, the reviews and feedbacks had all been positive. Thank you samedaysupplements for having stock of mesamoprh, which some of you would know very difficult to get hold of, and thank you for having it delivered to me in Europe in 3 days. Superb quality good and great delivery service. Best PWO Review by A.
I originally ordered from a different company that I quickly figured out why they had bad reviews, three weeks and not an update but they took my money. I disputed that charge and decided I should've just gone for SDS off the bat. So glad I did, literally hours after my order and they shipped the product. They do SurePost delivery for cheapest option which is fine if you order before you run out. Now the Mesomorph, I used to take C4 and the original back when it was available and I always looked for that feeling. Eventually O E P went away and I was up to 4 scoops of C4, that lasted for a year and I went to NoBullXMT and that was great because of the pumps but it didn't keep me focused, always trailed off towards the end of my lifts. I found Mesomorph from r/fitness and this thing is amazing. Since my body was used to caffeine and from O E P I jumped into the full dose and yep, nothing but great focused workouts. The amount of focus is insane and ever set and every rep feels like a new one. You never get that exhausted lost of focus feeling. I even have to tell myself that it's the end of my workout.I got two orders of watermelon and it tastes like medicine. I dont mind flavor though because its momentary, its what comes after that counts. 10/10 would buy again.. and again.. from SDS. Mesomorph is an excellent product. First time today I used it and had to force myself to get out of gym to go to work. But , If I praise it too much many people will start buying it and it will be gone. Like anything, your tolerance level and body reaction will be different from others so hearing "jitters" reaction stories etc is all relative to the person. This preworkout gives a great stimulation and focus prior to working out and I personally haven't experienced a pump from a preworkout ever, but maybe if you're new you will. Its a solid pre workout but very strong and not for the beginners or armatures. I wouldn't recommend it for young people either (under 23) as you should have more than enough energy. Hands down the BEST Pre Workout Stimulant I have ever taken. Ive finished tubs of Jack, N.O. Xplode, Fast Twitch, Muscle Fuel, c4, and super Pump. None can Compare to the amounts of Energy and Focus that Muscle Fuel Gives you.. The only cons I can think of Is being overly Wired.. If you are caffeine sensitive, then I wouldn't recommend this product.. or at least start with half a scoop and work your way up. This is an incredible preworkout!! By far one of my favorites! I am a stim junkie and the mesomorph has never let me down! The rocket pop flavor was SO good! It was like having the popsicle! It mixes very well too! The energy and focus are my two favorite features where this pwo prevails! It kicks in within 20 mins and last for hours! Gives you a drive making you want to keep going and keep pushing yourself! I had no trouble getting right in the zone and fully focusing on my workout! The hard part is convincing yourself to stop! Haha The pump is great as well! Just right for me! Not so crazy that you can't move but enough to where the blood really gets into the muscles well! I have and will continue to reccommend this pro to others! I have been using Mesomorph for ~1 year off and on and it never stops delivering! The new Rocket Pop flavor is #1 though, it really tastes like the popsicle. The first time I drank it, I wanted to mix more! It was that good! Pineapple Meso was my #1 but this takes the cake. APS does a great job with all the Meso flavors but this is by far the best one in my opinion. I really hope it becomes a standard flavor, tempted to order 4 or more tubs so I have some in case they keep to the limited edition model. We have a large selection of in-stock APS Nutrition products including Pre Workout items and others for the lowest prices at SameDaySupplements.com® It's always easy to shop for Mesomorph® by APS Nutrition®, Pre Workout at SameDaySupplements.com® because you can browse by reviews, brand, prices or search for specific ingredients using our search tool. In-stock orders placed before 3pm EST ship out the same day to USA, Brazil, United Kingdom, Canada, Germany, Australia, Japan, India, France and worldwide at the cheapest prices online.